SOSTURMAC and SMARTLODGING4GUEST present at fi2, the largest forum for innovation and technology in the Canary Islands – ITER – Instituto Tecnológico y de Energías Renovables, S.A.
With these two projects, ITER seeks to promote sustainable tourism through energy efficiency, renewable energy and ICT. 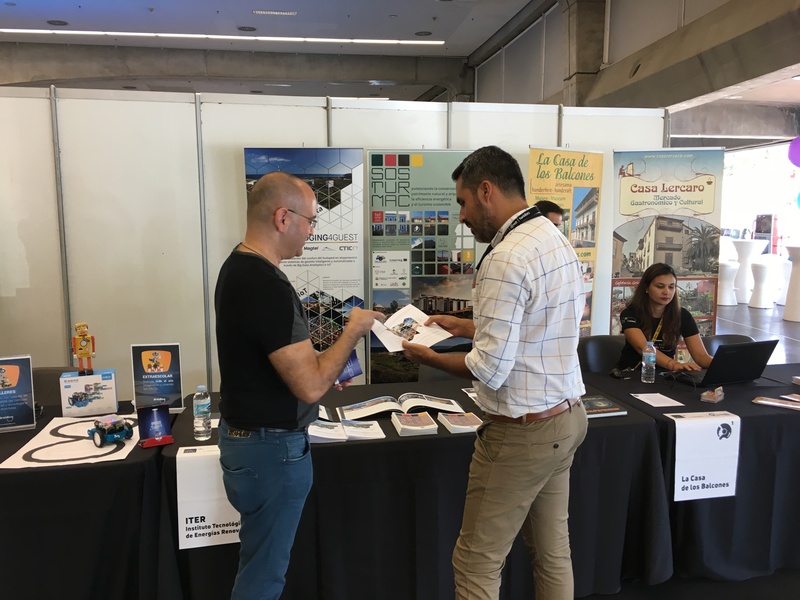 ITER participated in the VIII edition of the Innovation Forum fi2, organized by the Cabildo Insular de Tenerife through Intech, which took place on September, 26-27 at the exhibition grounds of Santa Cruz de Tenerife. 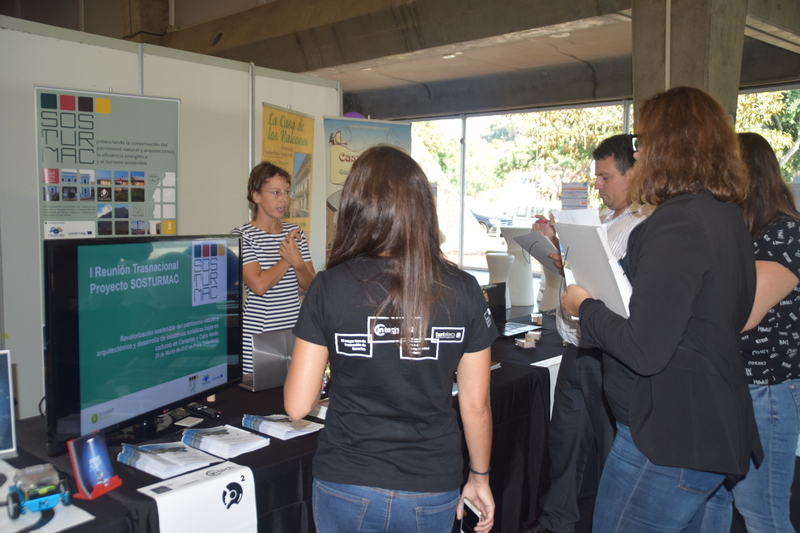 This edition of fi2 was aimed at showing the new trends in tourism and the technological advances in the sector. For this reason, ITER presented in the technological showcase of the Forum the first advances of two of its projects related to this topic, the SOSTURMAC project and the SMARTLODGING4GUEST project. The SOSTURMAC project – “Sustainable revaluation of natural and architectural heritage and development of low carbon tourism initiatives in the Canary Islands and Cape Verde”, cofinanced by the Madeira-Azores-Canary Islands Interreg Territorial Cooperation Programme (MAC) 2014-2020, aims to promote the conservation of the architectural and natural heritage, as well as the integration of renewable energy and energy efficiency systems into the heritage, thus promoting sustainable tourism in the Canary Islands and Cape Verde. ITER leads this project, transferring its experience both in the development of low carbon technologies and in the management of a zero CO2 accommodation, the “Casas Bioclimáticas ITER”. The participation of SOSTURMAC in this event is part of the awareness campaign on conservation of the heritage and promotion of sustainable tourism that this project is carrying out in both territories. The SMARTLODGING4GUEST project – “Maximization and customization of the guest’s comfort in hotel accommodations by means of intelligent and automatized management through big data analytics and IoT”, led by ITER and financed by the FEDER Innterconecta 2016 Programme, seeks to optimize the comfort of hotel accommodation customers by implementing ICT tools. The project aims to make these establishments more intelligent and adaptable in an autonomous way to the behaviour, use patterns and preferences of the clients. All of this, furthermore, must be achieved without undermining the energy efficiency of the building. This scenario is only possible by betting on sustainable architecture and on the technologies integration and control solutions implementation aimed at greater and better performance. The VIII edition of fi2 was developed under the motto “Continuous innovation in the tourism sector has repercussions on improving the competitiveness and productivity of the tourism system”, on the occasion of the commemoration of the International Tourism Day and the International Year for Sustainable Tourism for Development, addressing this issue of vital importance for the economy and companies of the Canary Islands.